Dividing perennials is an easy way to create new plants from the existing plants in your garden. Division can also be used to control the size of a perennial that spreads too freely or to rejuvenate an older plant. Many perennials grow to form a patch, which over time can outgrow the space allotted and become so clogged with roots and dead plant parts that it starts to look shabby and bloom poorly. Division is the solution for this common problem, but it's also necessary for many perennials, even if they have plenty of room to spread. The latter situation mainly applies to plants that grow from underground tuber, bulbs, corms and rhizomes - in other words, anything with a fleshy underground root system. Regardless of your reason for dividing the plants, you'll follow the same steps to do the division. Water the plants a day ahead of time to make it easier to dig them up. 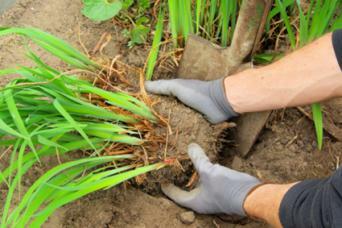 With a sharp spade or shovel, dig up the entire clump with as many roots as possible. Cut the clump into several sections with a shovel or knife - it's ok if you damage some of the new growth, but make sure each division has several shoots or stems. Remove any broken or dead leaves, stems, and roots with a sharp knife or pruners. Replant divisions at the same depth as the original plant, gently packing soil around the roots, and water well. Keep the newly planted divisions well watered until their roots are established. Dividing plants that grow from tuberous root systems, such as iris and cannas, requires a little more finesse than dividing other plants. 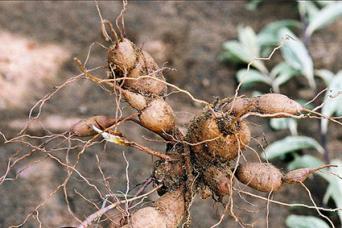 Rhizomes are the thick stems that grow below the soil's surface. Carefully lift the entire clump of rhizomes out of the ground. Shake or rinse away the soil that clings to the rhizomes. Cut the young rhizomes away from the older segments with a sharp knife. The clump will consist of older, spongy rhizomes and lighter-colored young ones growing from their sides. 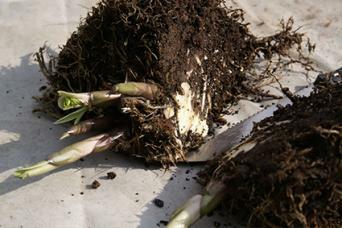 Replant only plump and healthy-looking rhizomes and discard those that are old, withered, or diseased. The top of the rhizome should just show above soil level. The basic rule of thumb is that if a plant blooms early in the season, divide it late in the season, and if it blooms late, divide early. Avoid dividing perennials when they are in bloom. That being said, climatic extremes can also determine when it's best to divide perennials. In northerly climates, most perennials are best divided in early spring, after the soil has warmed up and growth has just begun. In southerly climates, fall may be the best time for dividing perennials. This allows the plants to get established over the mild winter. Some especially tough perennials, such as hostas and daylilies, can be divided anytime. How often to divide your perennials will depend on the plant and your conditions. If an established perennial produces fewer or smaller flowers than normal or the center of the plant looks hollow or dead, it may benefit from division. Plants that are growing and blooming well should be left alone, unless your goal is simply to make more plants. There are lots of little tricks that can come in handy when dividing perennials, some of which will depend on your particular situation. Try not to divide on hot, sunny days - dividing on a cool, cloudy day, or even during light rain, will help minimize shock to the plant. Plant divisions as soon as possible and don't allow them to dry out. To keep plants moist until they are planted, set them in the shade or in a pail of water. To reduce moisture loss after planting, trim the leaves of the plant by about two thirds. Fall is also a good time to divide many perennials, but be sure to do it at least a month before the ground freezes, so the plants have time to get established. In cold climates, it helps to mulch newly divided plants over the winter to protect them from damage caused by fluctuating temperatures. If the plant you are dividing is very large and you can't dig up the whole clump, you may simply use a shovel to slice down and remove sections of the plant, leaving the rest of it intact in the ground. Gardeners are often attracted to perennials precisely because they do not need to be replanted every year like annuals. As it turns out, most of them still benefit from being divided every few years, but the bonus is that you'll have lots of new plants, at no cost, to spread to bare areas of the yard.